Can the act of collaboratively transforming vacant, contaminated, abandoned, and/or underutilized properties into high quality green spaces—like parks, greenways, trails, and gardens—benefit the health of longtime community residents and prevent their displacement? Over the past year and a half, Groundwork USA has sought to answer this and other pressing questions through our Green Space Actions Evaluation Project. The recently completed evaluation was designed to gather preliminary evidence of community health impacts brought about by Groundwork’s revitalization of neglected green spaces and to clarify the guiding principles of this work in ways that advance health equity. The evaluation focused on community-driven “green space actions” in five Groundwork Trust communities. Examples of our green space action focal points include converting an old, contaminated rail line into a community park in one of Richmond, California’s poorest neighborhoods, or building a path that allows safe access to an underutilized rock-climbing wall in Richmond, Virginia. Alongside collection of baseline data for tracking health equity outcomes over time, we also gathered the stories of people actively participating in Groundwork’s green space action projects. Their voices lend an important first-hand perspective on the impacts of our work together. Evidence of health equity outcomes takes a long time to see across populations. Since the pilot evaluation timeline lasted just two months, we sought to lift up the ways in which Groundwork’s approach creates the antecedents of health equity in the near-term. In other words: what aspects of our green space action work promote ripeness for positive health outcomes to unfold among members of a community over time? Members of the Groundwork RVA Green Team build a path to make the Manchester Wall safer and more accessible. cultivating the next generation of environmental and civic leaders. experience and practice the art of teamwork and leadership. Groundwork RVA Green Team youth practice climbing the Manchester Wall. And there’s more. Groundwork’s green space action at Manchester Wall is both courageous and disruptive. 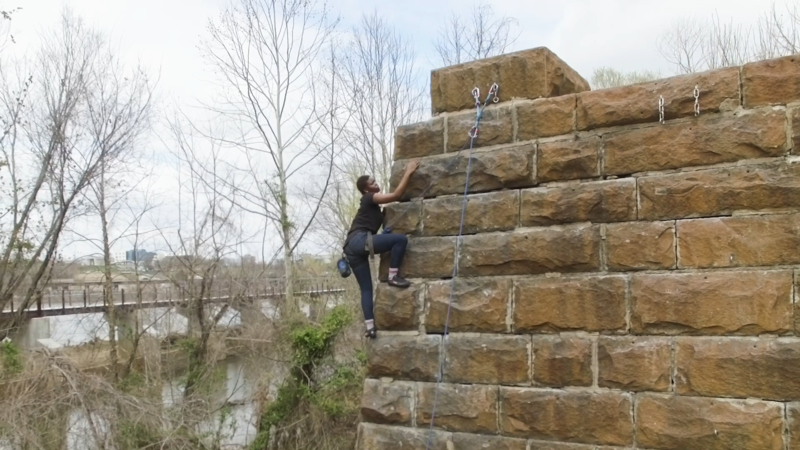 Through their intimate involvement in this work, Groundwork RVA’s Green Team members are also challenging racial and socioeconomic stereotypes simply by being there, caring for and improving the built environment while at the same time claiming their space on the climbing wall alongside their white peers. In climbing Manchester Wall themselves and working to make and keep it safer for all climbers (who have mostly been white), these young people gain a sense of ownership of that space, too, making it more familiar and accessible for themselves and other youth of color in Richmond, most of whom have had little exposure to outdoor recreational activities like rock climbing. Because Groundwork works at many levels of partnership, these same youth now have full-year climbing passes to learn and practice at the indoor climbing gym that created the outdoor wall. Here too, they are claiming space and exploring a healthy activity that is usually too costly for many of their families to afford. The pilot evaluation also highlighted several principles that guide the leadership of Groundwork green space actions. Across many different communities, we are leading projects and programs that center the experience and insights of historically underrepresented community members. Through deep engagement of local residents in visioning, negotiating, designing, assessing, cleaning up, and transforming underutilized urban spaces into built environmental assets to be enjoyed by local community members, Groundwork green space actions help people invest in reciprocal relationships with one another and build trust over time. As longtime innovators in the urban landscape, Groundwork people understand that vacant, abandoned, contaminated, and underutilized sites are not only commonplace, but concentrated disproportionately within low-income communities and communities of color. What we are increasingly coming to understand is how creating intentional, connected processes for transforming these parcels—long viewed as liabilities—is key. What we know to be true—now backed by preliminary evidence—is that the collaborative reclamation of underutilized land in a community represents one of the best opportunities for developing an “all hands on deck” equitable development strategy. When this reclamation is co-designed and co-led by cross-sector teams with residents and young people as chief architects and voices, opportunities emerge to holistically address the social determinants of health in the surrounding community, thereby investing in people alongside place. Our vision is that these types of silo-busting green space actions can be replicated in communities across the country and, over time, can build collaborative infrastructure from which community stakeholders can begin to take on long intractable challenges-like disrupting the repeating patterns of green gentrification and displacement-as they design, lead, and leverage their green space actions for a more equitable future, together. In Richmond, Virginia, by enhancing access to the Manchester Street climbing wall and the James River Park System in which it is located, Groundwork RVA Green Team teens are coming to see the wall as a place where they belong, a place they care for, a place they enhanced for themselves and for their community. In other words, the Green Team experience of fixing up the Manchester Climbing Wall and surrounds can become scaffolding for these future environmental and civic leaders to take on other complex issues in their community as they come of age and lead the equitable transformation of their community for the better. —Kate O’Brien (kate@groundworkusa.org) is Senior Advisor at Groundwork USA.